Read and learn how to help yourself ! Answers are illustrated with over 10,000 personal stories! FEAR! ... I am affraid to do cleanse ? Help me ? SAFETY: SICK? COLD? Should I cleanse when I have a cold? SAFETY: FATTY LIVER or ENLARGED LIVER ? SAFETY: MASTER CLEANSE FAST: Breaking a fast with liver flush? SAFETY: PANCREATITIS or JAUNDICE caused by flushing? SAFETY: STONE STUCK in duct ... Can the flush help? SAFETY: SURGERY! Reasons needed for avoiding gallbladder removal? Stones prior to oil/grapefruit mix? SCIENCE: ANALYZED STONES - GALLSTONES? ... Liver Stones being analyzed ?.. SCIENCE: COMPOSITION? What are gallstones composed of? SCIENCE: EPSOM SALTS? What are Epsom Salts ? Magnesium Sulfate Heptahydrate? SCIENCE: Can oil that we drink, lubricate bile ducts? SCIENCE: Colors? ... Gallstone Colors ? What do the colors indicate? SCIENCE: Has anyone had an ultrasound before & after a cleanse and had positive result? SCIENCE: How do we know that stones are formed inside liver? SCIENCE: OILS? ... Can I use some other oil? SCIENCE: SIZE: What is the size and weight of the liver? SCIENCE: Why do stones melt OUTSIDE of the body? SCIENCE: Why is Epsom Salt burning on the way out? Are green blobs baby gallstones? Does anyone know the origins of liver flushing? EXPERIENCE: ATTACK ! ..HELP! Gallstones Attack! Pain ... What can I do? EXPERIENCE: CALCIFIED STONES? 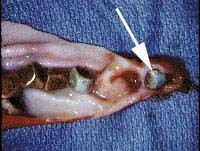 Is there anyone who flushed calcified stones out from their gallbladder? EXPERIENCE: CITRUS ALLERGY ... Can I use non-citric fruit juice when doing liver flush? EXPERIENCE: DOCTOR! ... positive feedback from their doctors about doing liver flish? EXPERIENCE: extreme diarrhoea with 1st flush - are Epsom salts really necessary? EXPERIENCE: Liver Enzymes, Cholesterol, Blood Lipids, can liver cleanse help? EXPERIENCE: NO STONES! ... Second flush and AGAIN no noticeable stones??? EXPERIENCE: Olive Oil and Malic Acid Questions? EXPERIENCE: STONES & NO FLUSH! Can you get stones out without flushing liver? Easier Way to flush everything out of your liver - Egg yolks and Lime Juice flush? This survey is aimed at people who have at least once tried a Liver/Gallbladder Flush. If you have never tried a liver flush, you should not participate in this survey. Instead, you can proceed directly to the survey results. Soon, there will be other survey aimed at people who have never tried a liver flush. Liver Flush is a very popular cleansing method and results achieved are sometimes very dramatic. Enter the liver flush forum and click on the recommended messages link. You will find large number of stories, from people who often achieved almost "miraculous" healing. How safe is the flush? How effective? For who? Are there people who should not do the flush? Internet survey is the cheapest way of finding a fairly reliable answer to those questions. This table clearly illustrate benefits of repeating liver flush at least 7 to 15 times. If you follow the guidelines, you can find stats for over 200 health problems. 51% CURED! and the rest 49% reported condition improved! Chronic Acne are considered incurable (but treatable) by medicine. Chronic Allergies are considered incurable (but treatable) by medicine. Psoriasis is considered incurable by medicine, but in some cases it is treatable. Eczema is considered incurable by medicine, but in some cases it is treatable. Juice-Fasting: The Powerful healing therapy no-one ever uses. Gallstones Attack Curing Protocol (long) - full program. Gallstones Story "The Third View"
This photo was obtained from Edward C. Klatt MD, University of Utah Health Science Center, which retains the copyright. 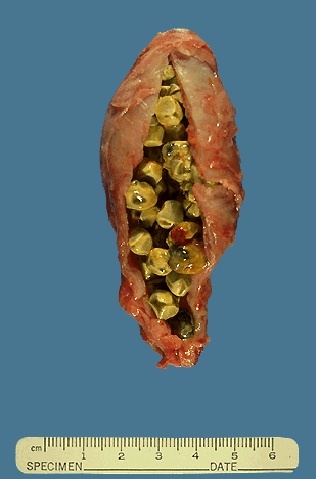 Multiple yellow-tan faceted gallstones are seen in the opened gallbladder pictured here. 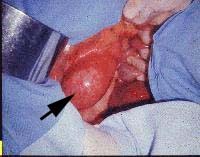 It is possible for a stone to exit the gallbladder via the cystic duct. It may then produce obstruction of cystic duct, or it may get into the common bile duct and obstruct that. It may obstruct at the ampulla of Vater and produce a pancreatitis. Biliary tract obstruction leads to jaundice with increased total and direct bilirubin in serum . Judging from the size of the stones, and from the number, those stones have been created inside liver, inside hepatic bile ducts, and then have rolled down to the gallbladder. People who have such a small stones inside gallbladder, can easily cleanse them with gallstones cleanse. When your gallbladder is so full of stones, you can count that you already have at least 2000 stones inside your liver ! Note: Gallstones are not only green in color. They can be of any color ! Those Stories have ben taken from the Archive of Gallstones E-mail Support group. This is a gallbladder that has been opened after its removal to reveal hundreds of cholesterol gallstones. It is no wonder that some would intermittently leave the gallbladder and cause pain or other complications. People who have such a small stones inside gallbladder, can easily cleanse them with gallstones cleanse. The small yellow speckles (arrow) within the lining of the gallbladder are called cholesterolosis. 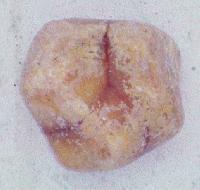 This may represent a precursor to stone formation, and can by itself be associated with symptoms insome patients. People who have such a small stones inside gallbladder, can easily cleanse them with gallstones cleanse. 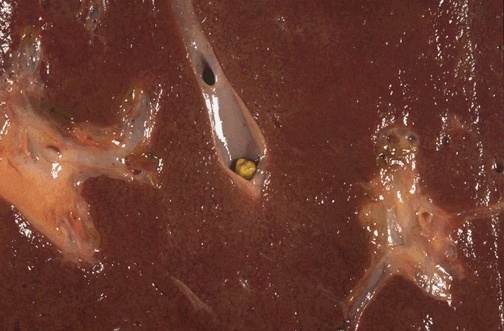 The black specks within this gallbladder are pigment stones. These are the types of stones seen in patients with hemolysis of red blood cells from parenteral nutrition, infection, or the malnutrition of cirrhosis. These large stones have likely been in the gallbladder for a long time. They consist of a mixture of cholesterol and bile pigments. While they usually don't pass out of the gallbladder, they can erode through the wall and may represent a risk for gallbladder cancer. Here you see several white stones within the neck of the gallbladder. One, in fact, is stuck in the cystic duct (arrow) and likely led to an episode of acute cholecystitis. These are limestones, and are easily seen on a plain film of the abdomen. 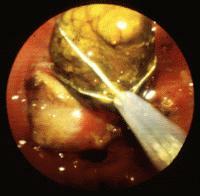 Most gallstones cannot be seen in this way. Do you see the "trademark" that lends this stone its distinguishing characteristic? The cynic amongst you might associate the nomenclature with the lifestyle of surgeons that perform numerous cholecystectomies, one of the most common major operations performed in America. It is important to remember that over half of patients who have gallstones have no symptoms from them. However, once symptoms occur, they tend to progress. What you see here is a stone that has been trapped in a device called a basket. The basket with the intact stone is being withdrawn from the bile duct. Basket is used to withdraw the stone attached. 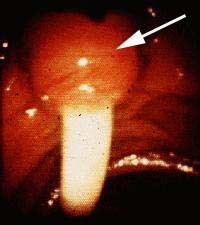 The papilla (a protrusion into the lumen of the duodenum, arrow). It is an Ascaris, a very common intestinal parasite that likes to live in the bile ducts. Its migration in and out of the papilla causes an intense inflammation and fibrosis in some people. 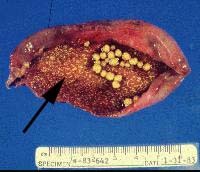 In fact, the passage of gallstones can cause the same thing; a disease called stenosing papillitis. What do these people complain of? They complain of recurrent episodes of severe upper abdominal pain, and may develop jaundice and fever, or other signs of cholangitis or pancreatitis. When the formation of scar tissue is advanced, they may develop a very large bile duct, and stones and strictures within the proximal biliary tree. Dr. MacFadyen: I like to perform a laparoscopic cholecystectomy through the placement of small tubes called ports that are placed into the abdomen once it is distended with carbon dioxide. The procedure is carried out under general anesthesia. 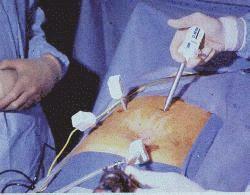 The port at the lower end of the picture allows the passage of a camera into the abdomen. At the right upper aspect of the picture you see the insertion of a working port that allows passage of operating instruments. There are two additional ports on the right side of the abdomen that are used for manipulating the gallbladder during its removal. If you look below you will see what a good view we get of the gallbladder on the television screen. Dr. MacFadyen: As you can see, she clearly has acute cholecystitis. The region of the neck of the gallbladder and cystic duct appears readily accessible. We should be able to remove the gallbladder safely. Here we are looking through an incision below the right costal margin. What you see here is an acutely inflamed gallbladder (arrow). In contrast to laparoscopic removal, which is from the cystic duct towards the fundus, in the open procedure, we remove the gallbladder from the top down towards its junction with the bile duct. This approach allows one to precisely identify the junction of the gallbladder to the latter structure. What is Flax seed oil ? What is Gallstones flush - Liver cleanse -Gallbladder cleanse? What is causing gallstones ? Has any one had their gallbladder removed and still had the pain of gallbladder attacks? The importance of Flaxseed Oil taken on a daily basis. Would it not be better to take the actual flax seed, since the oil can go rancid? I've read from several now that once you do a gallstones flush, you have to keep doing them. Is this true? Does this mean that once one has done one that we should do it every 2 weeks or in our lifetime? How do I know that those green blobs (gallstones) are not just congealed olive oil ? 1. My gallbladder(GB) was removed, I did cleanse and I got hundreds of stones out ? 2. I saw few stones inside my GB on ultrasound, I did cleanse and I got hundreds of stones out ? 3. I am cleansing , and cleansing and still getting stones out ? 4. I never had gallstones, I did cleanse and I got hundreds of stones out ? 5. I had no symptoms of gallstones, I did cleanse and I got hundreds of stones out ? How many cleanses do you need ? What is Gallstones flush ? Finally it is accepted as self evident." cleansing the Liver and the Gallbladder of GALLSTONES without Surgery. We want to improve our health. in diet, and in the cause and prevention of disease." Gallbladder operation is the most common operation in North America. Every year, more than half a million people in the United States and more than 50,000 people in Canada undergo surgery to remove their gallbladders because of gallstones. Approximately 80% of all gallstones show no symptoms and may remain "silent" for years."